Clean, quiet hotel close to major universities and hospitals. Free wifi internet access and use of plunge pool jacuzzi. Located in a private compound off of Lopez Jaena Street, Circle Inn provides guests with comfort and peace while still being at the center of it all. This area is home to the city's many business establishments, bus terminals, major universities and hospitals. Circle Inn has 85 clean, quiet, well-maintained and well appointed rooms. All rooms are spacious and laid out based on international standards. The comfort and amenities of the rooms range from the basic air-conditioned hotel room to deluxe class accommodation comparable to international higher-end hotel rooms. Room decor is modern minimalist with a local touch. The hotel has 4 function rooms that can accommodate from 20 to 300 guests and complimentary wifi internet access is available in most areas including the rooms. It also has a small garden with a plunge pool jacuzzi for guests to relax and get some tan. A business center is also available for guests to do computer work, access the internet, print, copy, fax or scan documents. Within the hotel compound is a 24-hour convenience store for added convenience. Circle Inn offers rooms ranging from the standard airconditioned rooms to first class suites found in higher-end hotels. Other amenities include a coffeeshop, 24-hour room service, free wifi internet, business center, plunge pool jacuzzi and 24-hour convenience store. The Standard Room is furnished with a choice of two American size single beds or one queen size bed, air-conditioning, cable TV, hot and cold shower and complimentary wifi internet access. The Deluxe Room is a larger room and is appointed with 200 thread count linen and duvet on premium spring bed with refrigerator, mini-bar and complimentary wifi internet access. It is furnished with two American size single beds or one queen size bed. Some rooms are also additionally equipped with a bathtub. Designed for single, twin sharing or family with kids, the Executive Rooms are appointed with one queen size bed and one American size single bed with wall-to-wall carpeting. The ambiance is Asian-Modern and the rooms overlook the private garden and plunge pool jacuzzi. Circle Inn’s Executive Suites are the hotel's largest rooms appointed with one King size bed, office desk and chairs, two-seater sofa and coffee table as well as a split type airconditioning system for more comfort and a quiet night’s sleep. The suites are all carpeted with a generously sized bathroom. 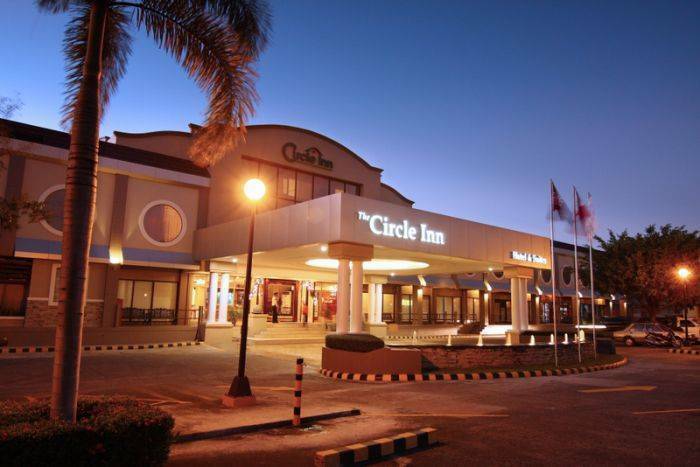 Circle Inn is located in one of Bacolod's major thorough-fare where many business establishments, major universities and hospitals are located. The hotel is in a private compound that affords guests with peace, tranquility and security. Serves local and international cuisine as well as 24-hour bar service. Cancellation allowed 7 days prior to check-in date. Cancellation within 7 days to check-in date including no-show will be charged one night's tariff. Domestic flights from Manila and Cebu land at the Bacolod-Silay Airport which is a 20-kilometer drive from Circle Inn. From the airport, visitors take the airport access road to Silay City and turn left to the National Road going south. Upon reaching Bacolod, take a left on B. S. Aquino Drive (formerly North Drive) where you will pass by Bacolod's major hospitals. On the fork of the road veer towards the right which will be Lopez Jaena Street. Circle Inn is about 3 blocks away. The port is 2 kilometers west of the hotel. Nearest airport: Bacolod-Silay Airport is about 20 kilometers away.